Dr Wayne Patrick with Paulina Hanson-Manful and Valerie Soo. Research focusing on the so-called "promiscuity" of proteins has implications for improving the development of new antibiotics in the age of superbugs. The research, by molecular biologist Dr Wayne Patrick and two doctoral students, focuses on the role protein promiscuity plays in the adaptation of species to new environments – the crux of all life, as Darwin discovered more than 200 years ago. Until a few years ago, the notion that proteins are promiscuous – or able to do jobs in addition to the ones they evolved to carry out – was controversial. "The text book view of proteins is that they are extremely specific, and not promiscuous at all," Dr Patrick says. The new findings address a significant gap in the Darwinian model by showing that it is surprisingly easy for organisms to evolve novel functions. 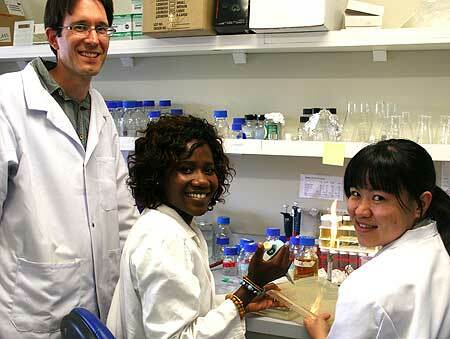 Dr Patrick, from the Institute of Natural Sciences, and PhD students Valerie Soo and Paulina Hanson-Manful, set out to gauge the extent to which a simple adaptive response – increased expression of a pre-existing gene – could impart new phenotypes [characteristics} on the laboratory bacterium, E. coli. "We amplified and sped up the process of microbial evolution to find that promiscuity in proteins - when triggered by certain conditions - can result in increased resistance to a much wider range of antibiotics and toxins than previously thought," says Dr Patrick. The researchers exposed E. coli cells to 237 toxin-containing environments. They discovered 115 genes coding for promiscuous proteins that, when over-expressed, promote growth in 86 of these deadly environments. In the process they uncovered a range of proteins that have previously not been associated with drug or toxin resistance. “Our experiments were by far the most comprehensive search for new routes to antibiotic resistance. While we focused on a non-pathogenic bacterium, we expect our high-throughput approach will prove useful for drug companies in the development of new antibiotics," Dr Patrick says. "By following our method, they will be able to predict whether promiscuous proteins will give rise to resistance – and therefore, whether their new antibiotic will be effective in the clinic for short or – hopefully – long periods." Dr Patrick was last year named New Zealand’s Young Biotechnologist of the Year and was a finalist in the Science and Health category of the Bayer Innovators awards. Last year he signed a licensing agreement with a United States-based life sciences company, Enzymatics Inc, to commercialise a novel technology he created for a new form of enzyme critical for next generation DNA sequencing. The technology can be used to develop personalised medicines, as well as to improve diagnostics and to accelerate basic research.